'Floy Joy' is the name of a 1972 album by the Supremes. 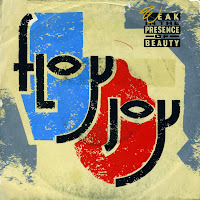 It's also the name of the band that debuted in 1986 with the single 'Weak in the presence of beauty'. This single did not chart, but when Alison Moyet recorded a version of that song, it shot to number 6 in the UK singles chart. I bought two versions of the single: the regular German pressing pictured here and a limited edition UK single on which one side could be used as a mirror. Like the accompanying card says: 'You too can grow weak in the presence of beauty'!